Faircount Media Group's "Veterans Affairs & Military Medicine Outlook" covers the budgets, programs, and initiatives of the Department of Veterans Affairs, the Defense Health Program and the Air Force, Army, Marine Corps and Navy Medical Commands. 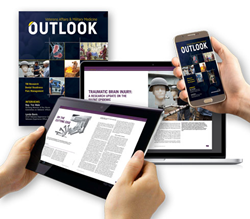 This issue of Veterans Affairs & Military Medicine Outlook magazine highlights some of the dynamic, ground-breaking, and life-saving work conducted by members of the Department of Veterans Affairs and the military community. In an exclusive interview with Rep. Tim Walz, D-Minn., he discusses his views on veterans and legislation, the challenges the VA faces today, and more. VA Chief Veterans Experience Officer Lynda C. Davis, Ph.D., talks about the Veterans Experience Office and its role as the "Customer Experience Office." Traumatic brain injury is featured in an article titled, "Research Update on the Silent Epidemic," with other editorial on pain management and opioids, community living centers, drug-resistant microorganisms, and robotic surgery. Issues of patient safety and dental readiness are discussed, along with other topics. Outlook is best enjoyed on your tablet or laptop. The publication can be opened here or by visiting https://bit.ly/2JJhIn1. Join our weekly Outlook eNewsletter. Do you provide medical equipment, services, or pharmaceuticals to the health care market? If so, Outlook reaches leaders and practitioners in the largest integrated health care systems in the United States, the U.S. Department of Veterans Affairs and the Military Health System. Call +1 (813) 675-3822 to feature your organization in the upcoming edition. Space is limited, call today.